Heat griddle on low heat. Separate 1 can (7.5 oz) Pillsbury™ refrigerated buttermilk biscuits into 10 biscuits. Tear piece of cooking parchment paper twice the size of a biscuit. Fold in half, and place a biscuit inside. 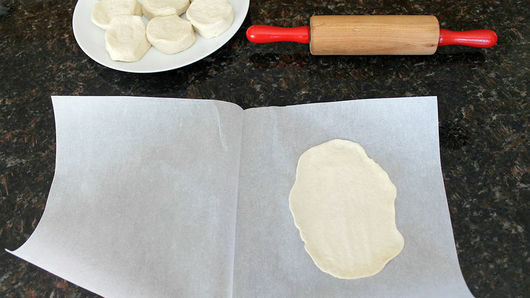 Using rolling pin, roll biscuit flat. 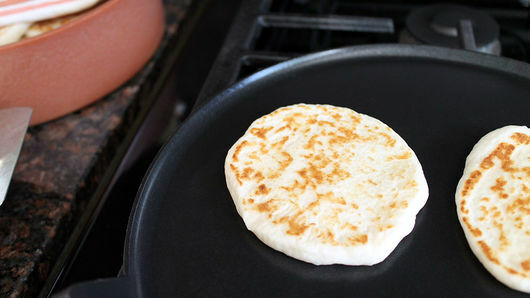 Cook flattened biscuit on griddle 30 seconds; turn, then cook other side 30 to 40 seconds or until done. Place in tortilla warmer or clean kitchen towel to keep warm as you finish the rest. Heat 10-inch skillet over medium heat. 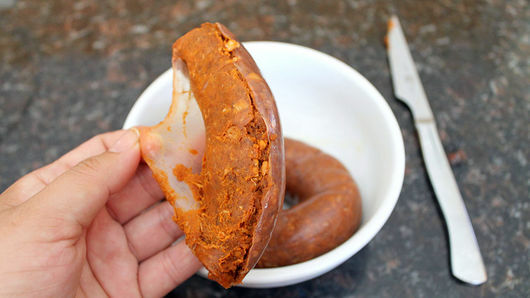 Remove casing (or plastic wrapper) from 10 oz beef or pork chorizo by slicing casing gently down length of chorizo to peel it off. Or cut one end, and squeeze it all out into skillet. Cook 5 to 7 minutes, breaking up chorizo with spatula as it cooks, until no longer pink. Meanwhile, in large bowl, beat 8 eggs with whisk. Reduce temperature of skillet with chorizo to low. Add egg mixture to cooked chorizo; gently stir. Once it begins to set up, let stand without stirring or folding as it cooks. 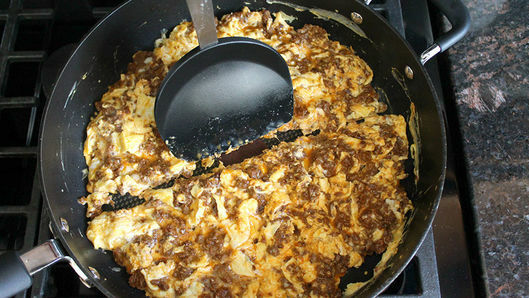 After 2 minutes, break chorizo and egg in 4 sections. Turn each section over to finish cooking. Cook 2 minutes longer; turn off heat, and cover. 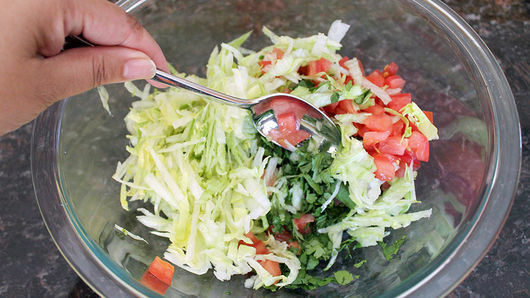 In another bowl, mix 2 tomatoes, diced, seeds and pulp removed, 1 1/2 cups shredded lettuce and 1/4 cup chopped cilantro, stems removed. If desired, add salt to taste. 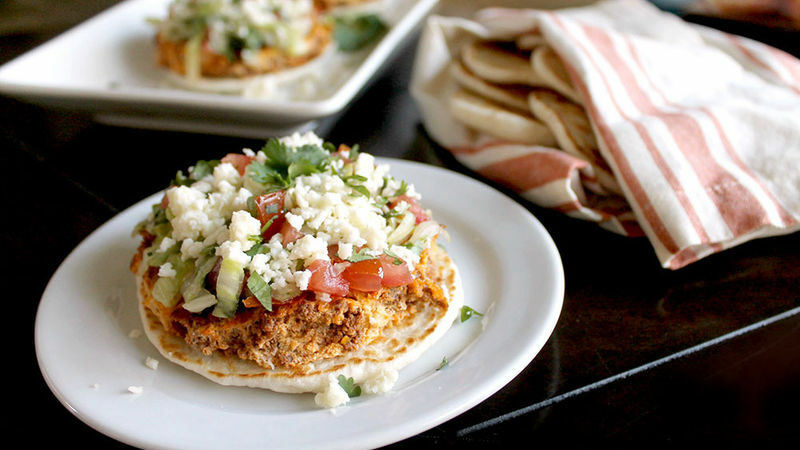 For each biscuit tostada, layer ingredients beginning with biscuit, followed by chorizo and egg, tomato mixture, then crumbled Cotija cheese. Prepare the eggs to your family’s liking -- over-easy eggs would be delicious! Mexican Cotija cheese is sold both in blocks or precrumbled. Look for it in your grocer’s refrigerated section.